Since I haven’t worked in a super corporate 9-to-5 office in a few years, I don’t really own many pants. I’ve got tons of denim and quite a few leather and faux-leather pairs, but no slacks. Most of the time they just look a little too “work” for me, but I found the perfect pair of printed pixie-cut pants at Old Navy that are the best mix of comfort and fun. Basically, they’re the quintessential pant for work and play! In fact, they’re so comfortable I’ve picked them up in white and clay (both great basics). Here I’ve dressed these pants up for a night out with an embellished top layered over a classic shirt and some fancy strappy sandals, but I’ve also worn them with an oversized tee for a more casual look. Much to my surprise, these printed pixies really are so versatile – what could be better? Oh, maybe that these pants are only $25. Let’s just say I stocked up. Click here to shop the pixie in 11 different colors and prints! This top is so pretty, love the print mix. Cute pants! I just stocked up on a ton of stuff from Old Navy last week. Great prices! LOVE this look! That top is amazing! I saw an Old Navy ad on these pants but wasn’t sure how they would fit….they look lovely on you! 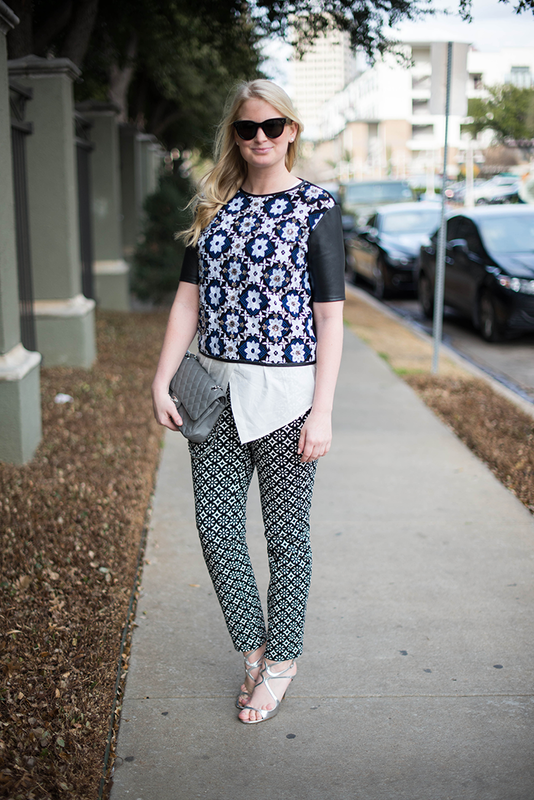 Such a fun mix of prints here – love this look on you! Wow, I love this mix of prints! The leather sleeve adds a nice touch of edge to the look as well, love! Love the prints! Gorgeous look! Those pants look so lux! I cannot believe they are Old Navy! haha you’re actually totally right about the shoes! My mom gave them to me because they hurt her, and they’re half a size too small for me. You can’t always win, am I right? 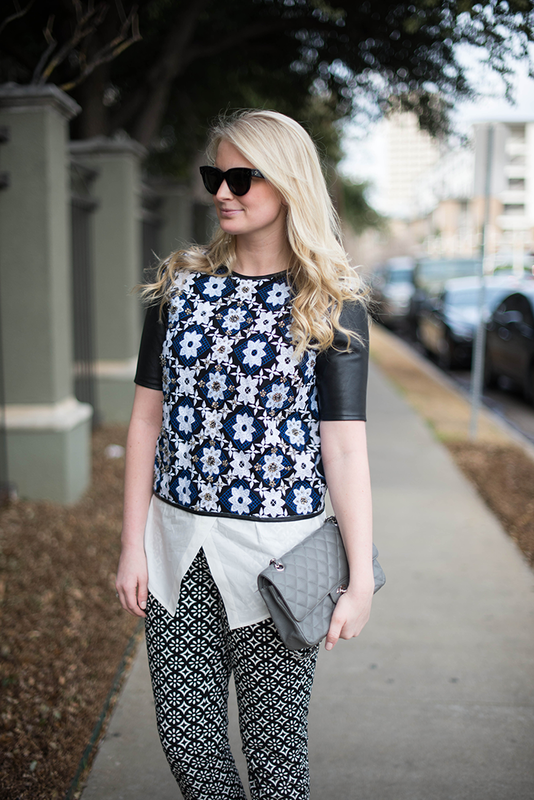 Love a great pair of fitted printed pants! Also, that top is gorgeous. Fantastic finds! Love that top, the print and leather details are amazing!! Thank you so much for being so sweet Merritt and for sending thoughts my way. I need to catch up on the Style Scribe now !! Gorgeous! Love the mix of patterns. This is the perfect mix of prints for the beginning of spring! I LOVE the mixed prints! SO good! Love those pants! Great look! I am always amazed with how much luck I have at Old Navy these days…they have totally stepped up their game! I really love the print mix and especially loving the top. And your metallic shoes work perfectly with the look! 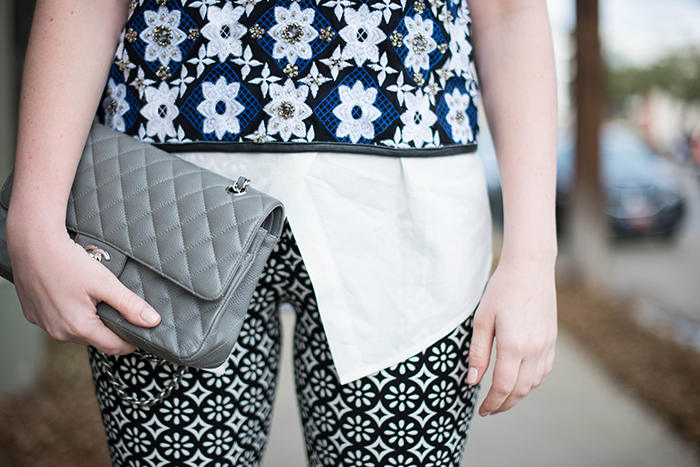 I have a similar pair of pants like this from Gap I love the pattern mixing. I’m the same way, I don’t own many slacks or pants of “corporate” style. I’m just not that into them but by the look of these I may have a change of mind, these are the “new corporate” pant. love the mixed prints and also the detail of the white shirt underneath… great inspiration under a semi-cropped top! Absolutely LOVE this look on you, Merritt! The pants are fab!! love those pants… i think i wanna them too. the pants look so chic. I love how you styled them. Love the print mixing!! Can’t believe those pants are from Old Navy! You’ve styled them to perfection, and they look so chic. I love the print mixing! I’ve been looking at the pants online. They look great on you, I might have to get a pair!